﻿ Dendera « Haikasoru: Space Opera. Dark Fantasy. Hard Science. 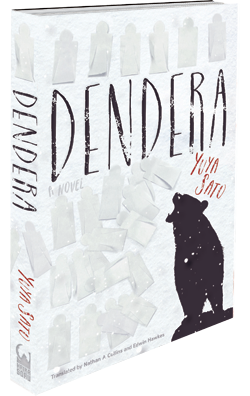 It’s the DENDERA giveaway contest! Yuya Sato, born 1980, is a writer of “strange fiction” which features fantastic or horrific concepts treated in a refined literary style. Some of his short work has appeared in English in the mixed manga/prose anthology series Faust. His novel 1000 Novels and Backbeard won the Yukio Mishima Prize. Makura Katsuragawa placed her hand over her nose as if to cover up the ravages of frostbite. “You’ve been saved,” she said. “Saved? What does that mean, saved?” Kayu Saitoh asked. Kayu Saitoh had never thought about life outside the Village during the seventy years that she had resided there, so Makura Katsuragawa’s words gave her a new shock. She understood vaguely on a theoretical level that there were places outside of the Village, of course, but the idea that she herself was no longer in the Village was beyond her comprehension, in the same way that she understood that birds could fly but couldn’t imagine flying herself.